My great friend Bryan, who lives in Livingston, Montana, sent me these fantastic pictures that he took looking out his window. Bryan and I go way back to our days at Hiram College in Hiram, Ohio. We also spent three months photographing the wonders of Australia. 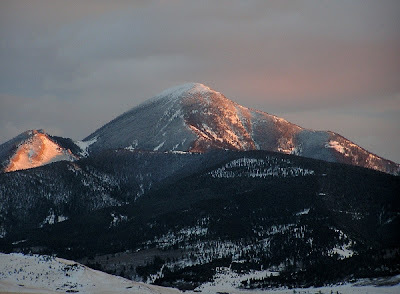 Bryan reports: "Here are some long-range shots from my upstairs window this evening (February 17)...at the high elevations, lots of snow last night, followed by lots of sun today. 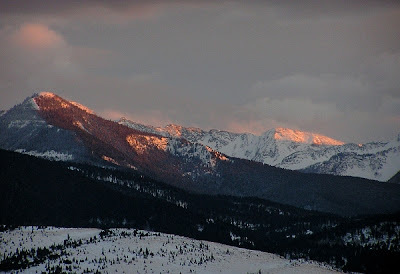 These are looking southeast from Livingston, the mountains are just inside the Absaroka-Beartooth Wilderness boundary. The first picture Livingston Peak, while the second shows the headwalls of a basin that you can hike into, about a 7 mile hike." Aren't these stunning? I can only image what it would be like to have this view from my upstairs window. Bryan, you've done well. I think we're going to want to see more images like these! Megan and I flew to Montana last July for Bryan's wedding. The flight wasn't cheap, but seeing Bryan in this wonderful place was worth every last penny. Coupling the joy of seeing a good friend for the first time in a long time, meeting each others life partners for the first time, and doing everything in such a beautiful place was a mind blowing experience. Here are more than a few shots from our trip to Montana and adjacent Wyoming. Megan and I are just hoping that Skybus starts flying to Bozeman! It definitely was an AWESOME trip! Montana is beautiful...I can't wait to go back to visit soon! Montana is so gorgeous. I would love to travel there someday. Awesome photos. Majestic mountain views!!! I hear John Denver when I see mountains. Must buy a CD of his. Beth Ellen- It is a terrific place. Megan and I almost had reverse culture shock coming back to humid, mountain less Columbus. Anna, Thank you very much. I really appreciate your insightful comments on several posts! David- I climbed to the top of Mt. Kosciusko while I was in Oz. It was quite a mountain, but Montana is a special place. Looks like a fun trip and beautiful views! Thank you Chris, Montana is quite a wonderful place!